We’ve all seen the brave soldiers, princes, and princesses riding their horses with a quiver hanging from their back and a bow and arrow in their hand. How fascinating it seems to shoot down animals from a distance and when it comes to war! These arrows can pierce right through the enemies. How do you think about archery for beginners? It seems mesmerizing, right? Don’t start worrying if you have a little or no understanding of the sport. Archery is all about shooting at the bullseye. It’s a great sport for people of all ages and occupation. It requires high precision, which anyone can achieve through practice. Many people start practicing this sport but slowly lose interest as they don’t get proper guidelines. If you get the proper guidelines, you’ll understand how easy archery is. It’s all about knowing the fundamentals and regular practice. Archery for beginners can be very easy to start up. Let’s look into the fundamentals that you need to know if you want to start archery as a beginner. Before starting, consult a skilled archer or your local archery shop. They’ll know what may fit you perfectly. This is particularly important because there are bows of different sizes and each has different draw lengths, and if you choose the wrong one, you may have to apply too much force to pull the bow. You may also join archery clubs. Professional and beginner archers meet up in such clubs, so you can discuss all the problems that you’re facing and get guides from the skilled archers. As we all know, the bow and arrows are the main constituents of this sport. Choosing the right bow and arrow can make a big difference on the accuracy of your shots. You must choose a bow with the poundage that fits you. Poundage is the amount of weight it takes to pull the bowstring back. The poundage depends upon the size and strength that you have. For arrows, you must choose the arrow that is of the proper length. To know the length of arrows you need, you should look at first measure your arm span. Then you must divide the number by 2.5. Choose arrows which are slightly longer than that number. You can purchase premium quality arrows from USA archery or Bear archery at a low cost. When you’re practicing archery, you must give importance to your safety. Expert archers often use an armguard to protect their hands from the snap of the string. Some also use a shooting glove which protects their fingers from the strain of pulling the string. As a beginner, you must also wear a chest guard so that you can flatten your chest and prevent the string from snagging onto your clothing. If you’re practicing in an area with other archers, wearing bright colored clothing is recommended. Doing this will make you more visible and prevent any accidents. To get better at this sport, you must practice hard. You’ll need a wide-open space for this. You can use your backyard or a local park but make sure that there’s nobody in front of you when you’re practicing. If you join the local archery club, you can sign up for a beginner’s course for basic archery lessons. These clubs often have spacious areas where you can practice. Before you start shooting, you must know which eye is the dominant one. It is particularly important because it heavily affects the accuracy of your shots. To determine your dominant eye, you must form a triangle with your thumb and forefingers. Next, you must focus on an object that is 15 feet away and make sure that it is in the middle of the triangle. Now close one eye and look at the object through the triangle. This is the eye that keeps the object centered in the dominant eye. You must always look with your dominant eye to increase your accuracy. If you’re using a rangefinder, you must know how to sight in your bow. Always choose a high-quality rangefinder to increase your accuracy. Your next step to master the fundamentals is knowing your standing position. Keep your chest and torso straight and slightly bend your knees. Hold onto the bow firmly and make sure that you don’t stumble when you’ve launched the arrow. One mistake that most beginner archers do is holding their breath when they’re taking a shot. You should never hold your breath while taking a shot because it will reduce the amount of oxygen that reaches your brain. It will hamper your eyesight, reducing your accuracy. It is recommended that you exhale when taking your shot as it lines up with the trajectory of the arrow. You must understand the wind direction before you take your shot. Always determine the wind direction and speed and adjust the angle of your shot. Expert archers often use a flag to know the wind direction and speed, and they adjust their angles accordingly. It’s said, ‘practice makes a man perfect.’ You must practice hard to get better at this sport. In Japanese archery, people often practice for ten long hours without a break every single day. Finding ways to get better at this sport is impossible if you don’t commit to sufficient practice. Select a routine for your practice sessions and make sure that you regularly attend these sessions! Archery for beginners is easy, but many people often face difficulties in getting started. 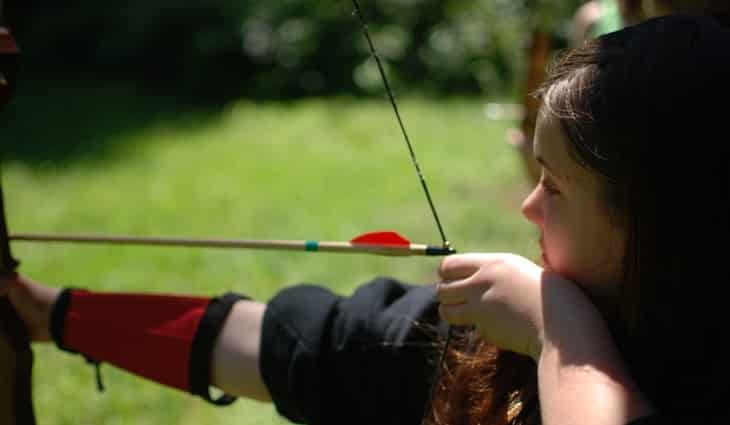 You can easily admit yourself to a local archery club and practice with other skilled archers. You should also understand the fundamentals of this sport and know the wind direction to get better at the accuracy of your shots. So, strap up all the necessary gear and start practicing this sport. Through regular practice, you will get better at this amazing sport and soon join the elite archery club.